Genuine Multi Terrain Pattern (MTP) para belt (half the depth of the para webbing base) for building your own belt order using MOLLE pouches. Constructed from hardwearing 1000 denier MTP texturised nylon fabric. • Made from 1000d MTP fabric. • Colour - MTP (Multi-Terrain Pattern). • For use with the Special Forces Airborne Webbing, MOLLE Belt. • Wider at shoulders than normal standard issue yoke. • Colour - DPM. Special Forces Airborne Yoke ��� For use with the Special Forces Airborne Webbing, MOLLE Belt. Special Forces Airborne Belt and Platform Webbing Systems. • Wider at shoulders than normal standard issue yoke. Available in A4 Sizes. A4 large size 21 x 30cm. 20 plastic sleeves. Picture shows all three available. Bookmark Us. • Minimi pouch with small pouch at side to take oil bottle. • Made from 1000d MTP fabric. • Colour - MTP (Multi-Terrain Pattern). • Double ammo pouch with velcro & press stud closure. • Made from 1000d MTP fabric. • Colour - MTP (Multi-Terrain Pattern). Fully Compatible With British Forces Issue PLCE. Colour - Multicam Camo. Strong Buckles & Webbing Used Throughout. Small Dpm First Aid Kit. First aid kit in a pouch with vertical and horizontal fittings. Zip closure. 1st Aid Kit contains Made from 1000 denier waterproof cordura 20x10x2.5cm. NOT including weekends. Heavy duty woven belt with fully adjustable quick release roll pin buckle with webbing tab. 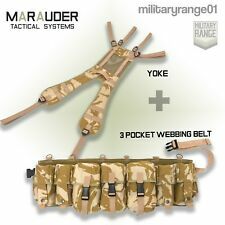 Suitable for use as a combat trouser belt or for carrying a knife/machete sheath, pouch or single holster. • Colour - DPM. • For use with the Special Forces Airborne Webbing, MOLLE Belt. • Wider at shoulders than normal standard issue yoke. and Platform Webbing Systems. • Made from 1000d MTP fabric. • Colour - MTP (Multi-Terrain Pattern). 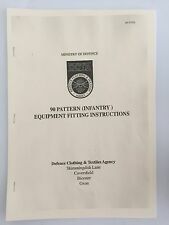 • Updated Soldier 2000 Hip Pad. THIS IS a BRITISH ARMY ISSUE UTILITY PLCE STRAP. ALSO MAKES A GREAT TROUSER BELT. The Multicam Wyvern Pegasus belt kit is a complete, all-in-one system for ammo carriage and utility carriage below the Osprey armour system. The belt kit pouches are integrated into the belt which is based on the popular Wyvern PLCE hip pad. BRITISH ARMY - 58 Webbing SIDE POCKET/POUCH - GRADE 1 USED. DPM Double Ammo Pouch. Available in British DPM. Universal ammo pouch. Made from 1000 denier waterproof Cordura. • Made from 1000d MTP fabric. • Colour - MTP (Multi-Terrain Pattern). • Our original Hip Pad. • Foam padded.